HOLLYWOOD - The American Cinematheque, in association with SabuCat Productions, presents TECHNICOLOR DREAMS: THE 2ND FESTIVAL OF DYE-TRANSFER TECHNICOLOR AT THE MOVIES (February 1-10, 2002), a retrospective showcasing a dazzling array of 17 films (many of them Oscar winners in various categories), shown in ultra rare, stunning I.B. Technicolor Prints, plus some rare trailers and "Making Of" shorts. Highlights of the series include: SAMSON AND DELILAH with Russ Tamblyn In-Person. All guests are subject to their availability. All screenings are at the newly renovated Lloyd E. Rigler Theatre at the historic Egyptian (6712 Hollywood Boulevard between Highland and Las Palmas) in Hollywood. Sunday, February 10, 2002 The Sunday, February 10th program begins at 5:00 PM with a screening of an Original Nitrate Technicolor Print of SAMSON AND DELILAH, (1949, Paramount, 128 min.) 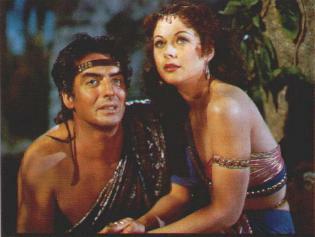 Cecil B. de Mille's wildly entertaining Biblical parable stars the great Victor Mature in one of his finest roles, as the legendary desert strongman and rebel fighter, who loses his strength and his eye-sight for the love of ravishing Hedy Lamarr. One of the most breathtakingly beautiful Technicolor films made in Hollywood - seen here as audiences saw it back in 1949, in an original nitrate Technicolor print!! Academy Award winner for Best Art Direction and Costumes. Discussion following with actor Russ Tamblyn.